Most people don’t realize the importance of posture and the effects it can have on your overall health. Having poor posture is one of the top three reasons for all visits to the doctor, and worsening posture over the years can decrease your life expectancy. While there is no perfect posture, here are a few reasons why maintaining good posture is important to your health. One of the biggest problems that can occur from poor posture is temporary or chronic back pain due to the pressure put on your joints and muscles from slouching. If you have a job that requires you to sit at a desk for most of the day, make sure you are sitting up straight. Even if you are a star athlete, poor posture can impact your performance and cause injuries, especially if you spend most of your day sitting for long periods of time. In order to enhance your posture when you are off the field or outside of the gym, make sure to take regular breaks throughout the day that involve some activity. Even taking a 15-minute walk can help improve your posture and ultimately your athletic performance. The natural height that we lose with age brings a greater chance of having a curved spine, which can cause tightness around many of your internal organs. These restrictions increase the chances for chronic health problems such as digestive issues, stroke, and heart disease. In order to reduce the risk for these health-related issues, treat your posture with the same level of care as you would with other habits, like healthy eating and exercise. Having good posture can impact more than how you appear. A study from the Journal of Behavior Therapy and Experimental Psychiatry states that “adopting an upright posture may increase positive affect, reduce fatigue and decrease self-focus in people with mild to moderate depression.” The tension caused by poor posture can also decrease your energy levels due to the compression in your spine. In order to keep both your body and mind strong, be sure to incorporate flexibility exercises such as yoga into your workout routine. 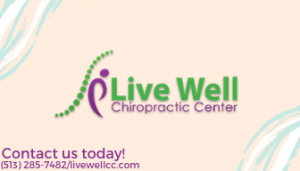 Live Well specializes in chiropractic services that improve posture including spinal alignment, compression therapy and general treatment and preventative exercises. We can also help your children improve their posture before bad habits become ingrained. To schedule an appointment, email us at info@livewellcc.com or call at 513-285-7682. If you have general questions, feel free to send us a message. The kitchen is the heart of the home and creating a fantastic meal for your family or entertaining is even better when you use fresh herbs. Herb gardens can be started and maintained in both indoor and outdoor settings and add some flair to your recipes. But you don’t need to be an experienced chef or gardener to grow herbs yourself. If you aren’t sure where to begin, here are a few tips for growing your own herbs and getting creative in the kitchen. When deciding on which herbs are right for you, consider if you want to grow indoors or outdoors based on the climate of your region. If you reside in a cold location, keeping herbs indoors might be best. Also, consider how much time and attention you have to make your herb garden a success. Some of the easiest and most popular herbs to grow are basil, rosemary, chives, parsley, tarragon, lavender, dill and mint. Once you have chosen your space and which herbs you are going to grow, the gardening process is fairly simple. Herbs need to be planted, watered and harvested frequently for the best results. Many herbs like oregano, chives and parsley can be grown in pots or containers indoors or planted in a well-lit soiled area outside. Deciding when to harvest depends on the herb, but they generally should be harvested before they flower. Removing approximately 1/3 of the growth with scissors will keep herbs growing at a more bountiful rate and better quality. Once you have your herb garden up and running, it’s time to head into the kitchen to put your homegrown herbs to use. Knowing which herbs to pair with certain foods can be tricky, but some of our favorites are using basil for making homemade pesto, rosemary herbs for grilled pork loin and dill for salmon. Some other options include using parsley, chives and tarragon for making herb butter to grill steaks or sea bass. Your homegrown herbs can be used for other household items in addition to food. Get creative outside of the kitchen by using lavender and cilantro to make bath bombs, soap, baking soda or decorations, or rosemary to make fresh herbal hair rinses. Rosemary and mint can also be used as an insect and mice repellent to keep unwanted pests out of your kitchen. We encourage you to stay healthy and safe while gardening by stretching and wearing protection for your knees when gardening outdoors. In addition to our safety tips, Live Well can help you with a variety of nutritional support and services. Contact us by emailing info@livewellcc.com or calling at 513-285-7682 or send us a message. Tennis is an amazing sport for many reasons. It’s a great aerobic workout that also strengthens your muscles, betters your balance and increases your physical stamina. Another bonus is that tennis is played in a social setting, has a degree of friendly competition and can be played almost anywhere throughout the year. While tennis-related injuries happen less frequently than other high-impact sports, there are a number of ways that you can minimize the chance for injury on the court and ultimately up your tennis game. Here’s how. Tennis is so fun that it’s common to want to jump right into the game, but warming up is an imperative part of any sports-related activity or workout routine. Failure to do proper warm-ups before heading onto the court can be harmful to your muscles and joints. Gentle stretches and basic aerobic warm-ups like jumping jacks, running in place and lunges for several minutes will not only prevent injuries but will also increase your performance. Drinking enough water not only makes you feel and play better, but it also helps your muscles. Dehydration can cause sodium and potassium levels to be abnormal, which is directly related to muscle strains. Make sure to drink water before, during and after your tennis matches to prevent dehydration, especially during the summer. Playing tennis frequently can be fun and exciting, but it can also increase the risk of injury, especially in your dominant arm. Tennis elbow is a common condition that occurs when the tendons in the lateral epicondylitis are being overused from the twisting motions in your arms. 70 percent of active tennis players develop tennis elbow at some point in time. The condition can cause severe pain on your elbow, forearms, and wrists that make everyday activities difficult. A common misconception about tennis elbow is that it occurs only from playing tennis. Many other sports, hobbies, and professions that require an intense or repetitive grip, like using a computer mouse all day, can also be a cause. If you’ve treated the pain from tennis elbow with at-home remedies such as over-the-counter pain relievers, icing, heating and rest and are still experiencing symptoms, it may be time to see a physician. While chiropractors are generally associated with providing treatments for the back, their techniques are also applied with great success to eliminate tennis elbow. Dr. Kim can treat tennis elbow by using adjusting techniques and rehabilitative exercises that focus on the fascia, or the soft connective tissues between your muscles. To schedule an appointment at Live Well Chiropractic Center, email us at info@livewellcc.com or call at 513-285-7682. If you have general questions, feel free to send us a message. Pregnancy can be one of the most exciting times in an expecting mother’s life. Whether it’s visiting a gynecologist or primary care doctor, getting proper medical care during pregnancy is beneficial to both the mother and baby. Adding a chiropractor to the list of doctors and specialists to see during pregnancy or even while trying to conceive is not only beneficial, but it can help make pregnancy easier and less uncomfortable. From pre-conception to post delivery, here is why you should visit a chiropractor if you are expecting (or trying to be). There are many misconceptions about what you can do to better your chances of becoming pregnant. There is no one specific cause of infertility, but one can be associated with an improperly functioning nervous system. Visiting a chiropractor can help with spinal alignment, which directly impacts the nervous system. While visiting a chiropractor doesn’t solve the problem of infertility, it is good supplemental care in addition to other fertility treatments such as in-vitro fertilization (IVF). Many expecting mothers ask if it’s safe to see a chiropractor during pregnancy. Not only is it safe, but it’s recommended to ease the pain and discomfort that can come along with being pregnant. Chiropractic care can help mothers-to-be maintain a better center of gravity and posture during pregnancy. Seeing a chiropractor and having proper pelvic alignment, allows the baby room to get in optimal position for delivery. Just as chiropractic care is a good way to make pregnancy more comfortable, postpartum chiropractic care can also help with rehabilitation. Visiting a chiropractor after giving birth can help with recovery time and alignment in the pelvis and back. Seeing a chiropractor can also assist with getting a new mother’s body back into its pre-pregnancy state, which can minimize the chances or symptoms of postpartum depression. From pre-conception to post delivery, Live Well Chiropractic Center’s Dr. Kimberly Muhlenkamp-Wermert specializes in chiropractic pregnancy techniques and is certified by the International Chiropractic Pediatric Association (ICPA) in The Webster Technique. Hear more from Dr. Kim about our pregnancy chiropractic care services by watching our educational videos, or visit our website to learn about our chiropractic services for pregnancy care. If you’d like to schedule an appointment with Dr. Kim, email us at info@livewellcc.com or call at 513-285-7682. If you have general questions about how a chiropractor can help during your pregnancy, send us a message. Whether your kids play soccer, baseball, lacrosse, track or any other spring sport, getting them ready for the demands of training season is essential to making sure they have fun, perform well and stay safe. Chiropractic care is one way to make sure they are in good physical condition and to prevent injuries. Here are a few ways that Live Well Chiropractic Center can help prepare your child for spring training. Parents of student-athletes may not be sure what to expect the first time they bring their child to visit a chiropractor. Much like getting a physical, visiting a chiropractor for a consultation can help discover any current ailments and prevent future injuries. During your first visit at Live Well Chiropractic Center, we can evaluate your child’s range of motion, posture and spinal alignment and find any pain points that might cause issues during the spring training season. If your child has taken a winter break from sports, getting back into the game might be challenging. Getting him or her prepared can be essential for success and safety. Chiropractic corrective exercises can be performed to bring back maximum movement and mobility if your child had a hiatus from sports during the winter. Live Well Chiropractic Center’s corrective services can help catch issues early on to provide precaution before spring training begins and results throughout your child’s sports season. The components that go into playing sports are more than just athletic performance and staying in shape. Having an optimal nutrition plan is important to a child athlete’s overall health, especially since children and adolescents are still growing. Live Well Chiropractic Center provides a variety of nutritional support that can help your athlete get ready for spring training and stay healthy throughout the sports season. While physical care from a chiropractor can be imperative for your child this training season, getting your child mentally prepared for a sport is just as important. Make sure to talk to your child about their sports interests to make sure to keep their spring training season both fun and rewarding. To schedule an appointment at Live Well Chiropractic Center, email us at info@livewellcc.com or call at 513-285-7682. If you have general questions, feel free to send us a message. As we get older, our bodies change, so too does our lifestyle and what we need to do to stay healthy. Keeping up with current health trends can sometimes seem like a full-time job, but it doesn’t have to be. Here at Live Well Chiropractic, we’re committed to living an active lifestyle, that’s why we wanted to provide some healthy tips for elder individuals. Change comes from within, so the first step in embarking on a healthy lifestyle is deciding that you want to. Since we’re creatures of habit, getting out of our usual, comfortable routines may seem difficult, but it doesn’t have to be. Here are a few things you can do to start leading a healthier lifestyle. Quit Smoking– it’s no secret that smoking is bad for you, and can lead to heart disease, cancer, and other health problems. While quitting may seem difficult, there’s a number of aids out available to help people break the habit. Individuals who quit, will start seeing results as your body begins to heal. Keeping Active– as we get older, our bodies begin to slow down, that’s why it’s important to stay active. Physical activity can strengthen muscles, improve endurance, and increase flexibility. Try to get in at least 150 minutes of activity a week through aerobics, regular walks, or home and yard work. Get Plenty of Sleep– getting plenty of sleep is an important part of healthy living. Regular exercise, positive bedtime rituals, and minimal artificial light will help you avoid waking up in the middle of the night, insomnia, and daytime drowsiness. Regular Checkups– scheduling regular visits to the doctor can help improve your quality of living. Screenings and other preventative measures from your healthcare provider can help you take precautionary measures and decide what changes to your lifestyle you may need to make. Eating Well– healthy eating habits are essential to the well being of any lifestyle, but are especially important as we get older. Maintaining a healthy weight and good cholesterol helps avoid heart attacks and diseases like diabetes as well as ease pain caused by arthritis. Stay Connected– emotional and mental well being is also a key part of living well, that’s why staying connected with members of your family and community are important. Strong relationships and interactions with other individuals help keep the mind healthy and strong. At Live Well Chiropractic, we’re all about promoting a healthy lifestyle. From pain relief to nutritional support, we offer a wide range of services to help you stay healthy no matter what your age is. So schedule an appointment today and for more great tips on healthy living make sure to like us on Facebook. Our mission at Live Well Chiropractic Center is to keep you healthy. Unfortunately, this time of year is particularly hard on our bodies because of the weather, the germs circulating around, and the innate desire in all of us to hunker down, eat lots of comfort foods and stay inside where it’s nice and warm. Part of maintaining a healthy lifestyle, though, is taking care of yourself and not always giving in to those temptations which can cause you to forgo exercise, healthy eating and other healthy habits. Plus, the sooner you adopt healthy habits, the easier it will be to keep up these lifestyle changes all year long. Even though we can’t be with you every second of every day, what we can do is share our best tips for keeping yourself healthy in between visits. 1. Visit Your Chiropractor With regular chiropractic visits, we can help your body remain in proper alignment, which gives your body its maximum potential to heal itself. 2. Exercise It’s difficult to get up and moving when the weather is cold and your motivation is low. However, according to the Mayo Clinic, exercise not only helps control your weight, but it can also keep you healthy, act as a mood, libido and energy booster, help you sleep better and it’s fun. If you are stuck for a place to exercise, check out these great indoor walking spots. 3. Get Plenty of Sleep Sleep is crucial for good health. Aim to get at least seven to nine hours of sleep a night to ensure better physical and mental health and a better quality of life. 4. Hydrate Experts recommend you drink at least eight cups of water a day. If you have a tough time drinking water, try having a glass when you first wake up, right before you go to bed and before each meal. It can also help to have water with you at all times. If you don’t like the taste, add lemon, cucumber, orange or lime slices. Adding whole or sliced berries also makes for a great tasting glass of water! 5. Eat Your Fruits and Vegetables Experts recommend eating at least five servings of fruits and vegetables a day for optimum health. Sneak spinach into your smoothies, snack on a banana with peanut butter or turn a side salad into a main meal with or without a lean protein on top. 6. Wash Your Hands Hand washing is the number one way to avoid getting sick and spreading germs to others. Remember to wash your hands before you eat, after you go to the bathroom and after you come into contact with other sick people or heavily-populated areas where germs thrive (public transportation, gyms, shopping centers, credit card machines, etc.). 7. Practice Mindfulness Mindfulness is an overarching practice that extends to every part of your well-being. You can do this in the form of meditation, setting aside quiet time, turning off all electronics, spending time in nature or practicing deep breathing. 8. Socialize Being around friends and family in a social setting gives your brain and body a healthy boost and lowers your risk of diseases such as dementia. Enjoy a physical activity or share a healthy meal with someone else and double up on your healthy activities for added benefit. For more in-person healthy living tips, visit us at Live Well Chiropractic Center. With chiropractic care from our clinic, you can expect to live your healthiest life, no matter the season. Call us today at 513-285-7482 or email info@livewellcc.com to schedule your consultation to learn more about the health benefits of our brand of chiropractic care. Be sure to check us out on Facebook, Twitter and LinkedIn for our latest updates!